This section allows a maximum deduction of INR 1.5 lakh and it includes the contribution made to annuity plan of a life insurance provider for the purpose of obtaining pension from the fund. This section includes the contribution to the Atal Pension Yojana and allows a deduction of a contribution up to10% of the total salary of salaried employees and 20% of the gross income of non-salaried to the government-notified pension schemes. The contribution can be deducted from the taxable income under Section 80 CCD (1). In case the employer contributes to the scheme as well, the entire contribution amount can be claimed as a tax deduction under Section 80CCD (2). It is important to remember that the complete deduction under Section 80C, Section 80CCC and Section 80CCD (1) cannot exceed INR 1.5 lakh in aggregate. The additional tax deduction amounting to INR 50,000 under the Section 80CCD (1B) is above this limit. This section allows deductions on the health insurance premium paid by the taxpayer. The limit for the same is INR 25,000 for self, spouse, and children and an additional INR 25,000 for parents. The limit for senior citizens is INR 30,000. Senior citizens above the age of 80 can seek a deduction of INR 30,000 towards their medical expenditure. An amount of INR 5,000 per family can be claimed as preventive health checkup expenses. However, this is not over and above the individual limits specified. An amount of INR 75,000 may be claimed as a deduction for spending on medical treatments of dependents with a 40% disability. This limit is INR 1.25 lakh in case of severe disability. Under this section, individuals who are below the age of 60 years may claim INR 40,000 for the treatment for specified critical ailments for self and dependents. The same limit is INR 60,000 for senior citizens and INR 80,000 for very senior citizens. This section which offered the tax benefits of Rajiv Gandhi Equity Savings Scheme has been withdrawn but if an individual has claimed a deduction in FY 2016-17, you are eligible to continue with the same for the next two financial years. This section allows individuals to claim a deduction for the loss under the head ‘Income from House Property’. It allows a tax benefit on the repayment of the loan of a second house up to INR 2 lakh. The unclaimed amount of loss may be carried forward for 8 years and set off against house property income. Additionally, any interest paid on the housing loan is eligible for a tax benefit. Municipal taxes, interest paid on the loan taken for the house, and 30% of the net annual income is allowed as a deduction. Interest on loan paid for education is eligible for deduction. Please note that principal repayment on the loan cannot be claimed as a deduction. The loan should have been taken for yourself, your children, and spouse or for an individual for whom you are a legal guardian. There is no limit on the amount of interest that can be claimed as a deduction. Individuals who are buying a home for the first time may claim an additional deduction of INR 50,000 on the home loan interest paid. This includes a clause that the loan should be sanctioned in or after FY 2016-17 and the amount of loan should be less than INR 35 lakh. Furthermore, the value of the house should not exceed INR 50 lakh and the individual should not own any other residential house under his name. This section includes all the contributions made to charitable institutions as well as relief funds. The contribution should be made through cheque, cash or in draft. The amount of deduction eligible is INR 2,000. Moreover, for donations made to political parties, the same deduction could be claimed under 80GGC. This section allows a deduction of INR 10,000 from the gross total income of individuals or Hindu Undivided Family. The deduction is allowed for the interest earned on the deposits made in a savings account in a bank, cooperative society or a post office. However, the deduction will not be application for the interest earned from fixed deposits in the bank. This section allows deduction to individuals who are physically and mentally challenged. MOBILETAX FY 2018-2019 AND PC FINAL VERSION -UPDATED ON 05-02-19 BY RAMANJANEYULU PERUMAL. 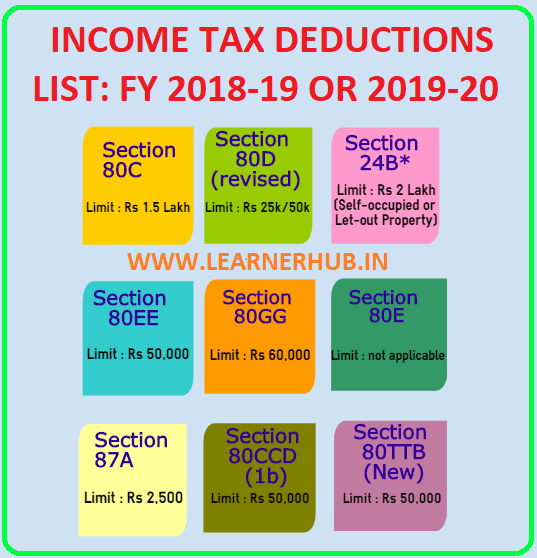 INCOME TAX SOFTWARE FY2018-19 ALL EMPLOYEES AP UPDATED ON 04.02.2019 BY K VIJAY KUMAR. INCOME TAX SOFTWARE FY 2018-19 -UPDATED ON 05-02-19 BY C.RAMANJANEYULU. AP MODEL SCHOOLS IT SOFTWARE FOR 2018-19 UPDATED ON 15/1/2019 BY CH V RAMANA MURTHY. INCOME TAX SOFTWARE FY 2018-19 UPDATED ON 13.01.2019 BY KSS PRASAD.